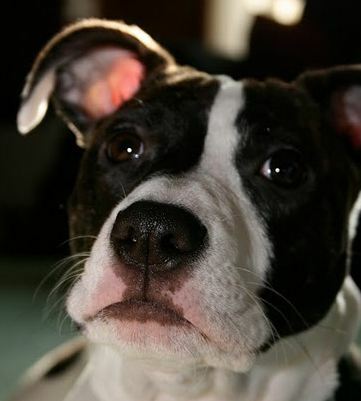 Trouble Finding A Place To Rent Because Of Your Dog or Pit Bull? Trouble Finding A Place To Rent Because Of Your Dog? If you are having trouble finding a place to rent because of your dog, Einhorn Insurance has 4 Tips that may help. Dog liability insurance can be very reasonable and covers bodily injury and property damage your pets may cause. Landlords are worried that they will be sued if your dog bites or hurts another person or animal. A dog liability policy will show a landlord that your insurance will step in and cover the unintentional actions of your dog(s). Einhorn Insurance also suggests you tell the landlord they can be listed as an Additional Insured on the policy. As an additional insured, they will be notified if your policy ever lapses for non-payment or cancels. To get a quote on insurance to cover your dog(s), please visit Dog Liability Insurance and click the GET A QUOTE button. Our dog liability policies cover all dog breeds including Pit Bulls, Rottweilers, Dobermans, German Shepherds, Staffordshire Terriers, Huskies..etc. 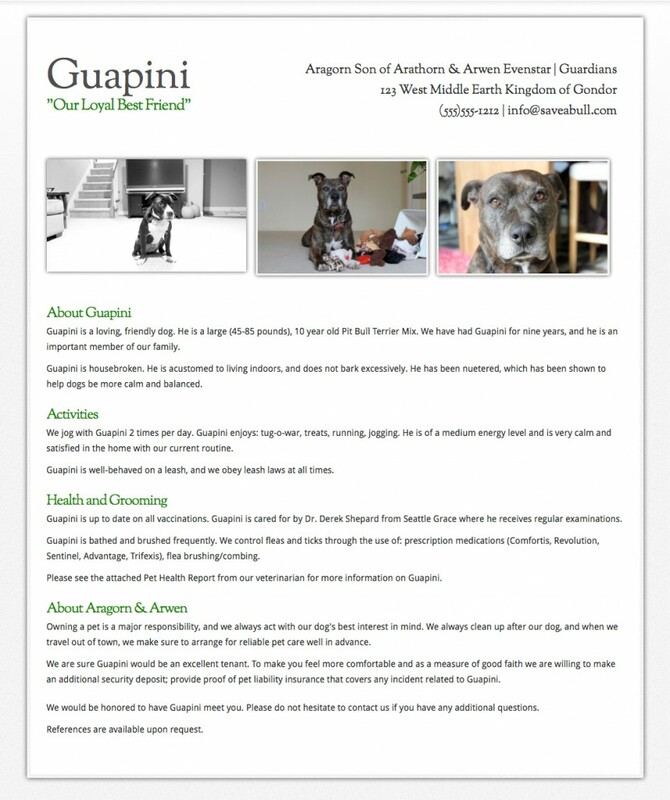 The goal of the Dog Resume is to highlight all the positive things about you and your dogs. The more personal you can make it, the better. Let your perspective landlord get to know you and create a personal connection. What you do for work. Why you love this specific rental. Landlords love it when you compliment their property. Talk about how you obey dog laws within your city, town, county and/or state. Discuss these laws and describe how you follow them. Are they potty trained and if so, how long have they been potty trained. Talk about how they are not just dogs, but family members. Let them know you carry dog liability insurance. Are you willing to provide a larger pet deposit? Did you rescue your dogs and have they been behavior tested? What do your dogs like to do for fun? Does your dog have a favorite food, toy or treat? Do they go for yearly check-ups? How often do they get flea treatments? 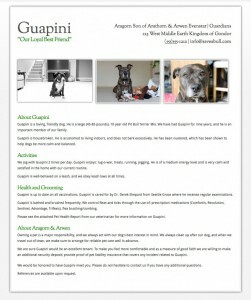 A portfolio about you and your dog(s) shows your prospective landlord that you’re an organized and responsible person. A portfolio will also show that your dog isn’t just a “dog,” but also a part of your family. Save A Bull’s Dog Resume Builder will help put this package together for you, and provide you with additional resources to help make your dog an appealing tenant. Letters from your vet and/or dog trainer about your dog. Vet records showing they are spayed, neutered and are up to date on shots. Any paperwork showing your dog has attended training or if they have a Canine Good Citizen Certificate. Letter from a past landlord saying what great tenants you make. If they don’t want to write a letter, ask if they can be used as a reference. A prescription from a doctor showing your dog is a therapy dog, emotional support dog or service dog. You can even get your dog registered on the National Service Animal Registry and show the landlord their service dog vest and Service Animal ID Card. 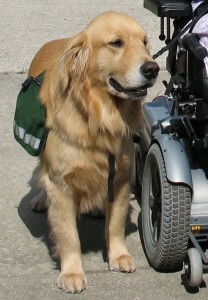 http://www.nsarco.com/index.html A landlord IS NOT allowed to ask what your disability is or why you need a service animal. You do not need to disclose this if you don’t want to. 4) Is Your Dog A Service Dog or Emotional Support Dog? Is Your Dog a Service or Support Dog? Your dog may qualify as a Service Dog or Emotional Support Dog. 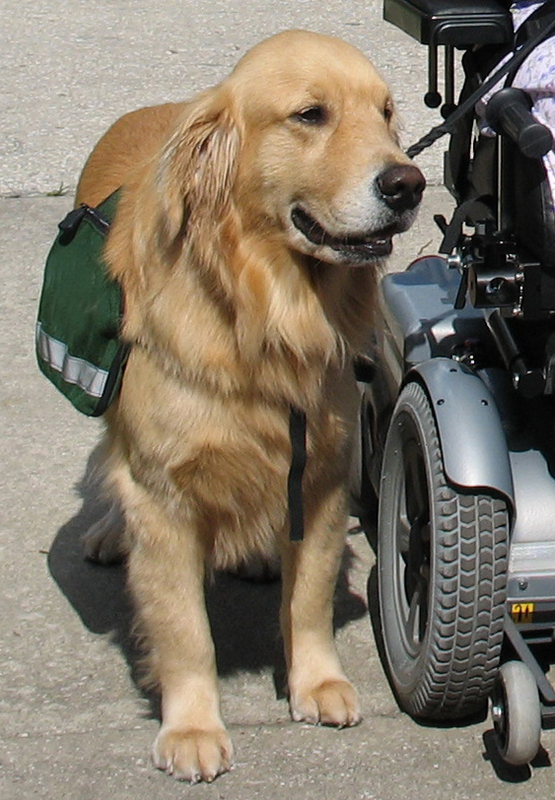 According to the Fair Housing Amendments Act of 1988, Section 504 of the Rehabilitation Act of 1973, and Title II of the Americans with Disabilities Act, people with disabilities (whether these disabilities are visible or can’t be seen), have the right to keep emotional support animals, even when a landlord’s policy explicitly prohibits pets. To read more about Service Dogs and Emotional Support Dogs and to see if you qualify, check out Emotional Support, Service and Therapy Dogs. Additionally, you are not required to disclose your disability. By following the above suggestions, you may have a much easier time to rent with your dog. We hope this helps keep your family together! If you have found dog friendly or Pit Bull friendly housing, please let us know so we can help others. This article is great . Responsible dog ownership is where we should be at, unfortunately in Ireland, we have a long way to go. That might be why some landlords wont allow pets. Would you mind if I add an link to your article from my site? Thanks for the comment. Feel free to add a link from your site. Awesome idea! I’m putting one together for my cats as well. I need to get a quote on insurance! I can’t believe how difficult it is to find somewhere to live just because my dogs are Pit Bulls. As some one who works and volunteers in the pet industry, I interact with a LOT of dogs and even though dogs may have similar breed characteristics, each and every dog is an individual. Insurance companies are breedists, and it’s SO great to see there’s a few out there who stand against it. Thanks Eihorn! I love Dogue De Bordeauxs!!! Every insurance company is different. You will want to look at the back of your policy under the liability exclusions section and see if there is a dog exclusion, animal exclusion or if certain breeds are listed. Have you heard about making your dog into a service dog? Please read this article for more details. Many people think you need a doctor’s note, but you don’t. I also recommend getting a condo policy that includes coverage for your dog under the liability portion of the policy. Thanks for this info, this is a great article! I will read the section on getting my dog certified as a service/emotional support/therapy dog… he most certainly is one of few reasons why I’m glad to be alive and able to care for him (for his unconditional love and affection). Do you know of any insurance companies that provide coverage in TN? Yes, we can help you with a policy in TN. Please go to our dog liability page on our website and click the Get A Quote button. Thank you. I absolutely love this. I submitted for a quote and I’m hoping so badly that my landlord will accept it. There is a shelter dog that my boyfriend and I fell so in love with only to have our landlord crush our hearts and say he’s on the blacklist for being a pit. I found out today that he’s in a kill shelter and no one else has had any interest in him. I hope this is our solution to being able to adopt him. If it is, our boy will owe you guys his life. What you do is so great, thank you so much. Westcreek Apartments in Westlake Village California takes ALL breeds no weight limit! It’s where all the Pit Bulls and German Shepherds live! Although I commend you for offering insurance on all dogs and not excluding certain breeds I think it is morally wrong to recommend people try to turn excluded breeds as Service Dogs or Therapy Dogs!!! It is one of my pet peeves that people make fake claims like this and it is one of the reasons it is so hard to rent with dogs. If you are a responsible dog owner you do not lie about your dogs!! I see posts on FB all the time where dog trainers or people that train and compete in dog competitions like SchH post pictures of their dogs with SD vests on in airports, hotels etc when they are going to dog competitions!! Just because you have a “trained” dog doesn’t make it a Service Dog and creating a “fake” Service Dog is a discredit to all the legitimate SDs out there and why more and more legitimately disabled people and their SDs are being discriminated against. If you have a true “disability” you shouldn’t have to be told to register it as one because it already will be one and I find it appalling an insurance company would recommend doing this. Many people with disabilities (seizures, diabetes, deadly allergies, severe depression, ptsd..etc) have learned about service dogs because of our website. I’m sorry it offends you. In no way are we telling people to fake illnesses to keep their dogs. I suggest you read the blog again as I believe you’ve misread it. The property management company MC Properties has no breed or weight restrictions for pets. Pitbulls are completely welcomed. The company is in Arizona and Texas. I would check to see if they have expanded to other states.